bake. It's a simple dish to prepare, but with a bit of extra care, you can make it super special. 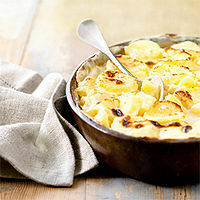 Desiree potatoes are the best variety of potato for potato bake. They are a soft potato that boils and bakes well and, as they have a very thin skin, they don't require peeling. Desiree potatoes are oval shaped with a pink skin. If you can't find desiree potatoes, sebago potatoes taste just as good. They do require peeling, which can be a lot of work if you are making a large serving. The following recipe makes enough to feed six. You will also need a deep baking dish. Mash together a knob of butter and crushed garlic and grease your baking dish with the garlic butter. Slice your potatoes into thin slices, about twice the thickness of a potato chip. The potato bake will cook more evenly if these slices are similar in size and shape. Place the potato slices in a pot of boiling water and cook for a few minutes, until they have softened slightly in the middle. The cooking time will depend on the size of the slices. Spread the potato slices in a single layer along the bottom of your baking dish. Top with cream and a handful of bacon and onion. Continue to layer the potatoes, cream, bacon and onion until you have used up your potatoes. Spread a final layer of cream over the top and cover with cheese. If you have the time, leave the dish to sit for about half an hour at room temperature, to allow all the ingredients to combine. Cover with alfoil and cook for about twenty-five minutes, or until the cheese is golden brown. Add sweet potato as well. It breaks up the colour and adds a little sweetness to the dish. Thanks for the great tips guys!